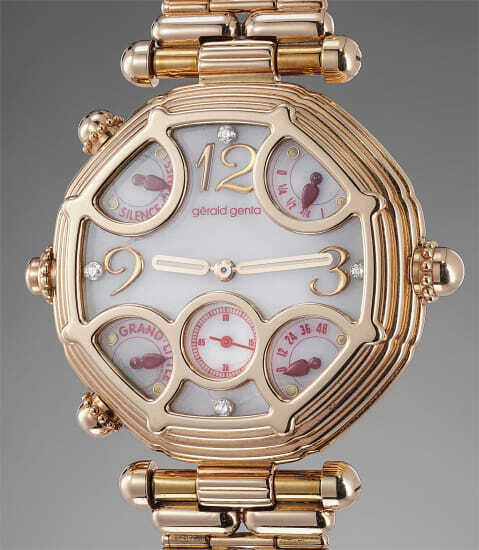 Model Name: "Grande and Petite Sonnerie"
Gérald Genta is one of the most influential figures in horological history. Having left an inedible mark in watchmaking, he is best known for creating iconic models such as the Patek Philippe Nautilus, Audemars Piguet Royal Oak and IWC Ingenieur. His designs are flagship models of each manufacture and some even argue that his creations have themselves become a brand in itself. In 1994, Genta embarked on a journey to create his most complicated wristwatches to date. A historically significant model in the world of horology, this timepiece was one of the most complicated wristwatches in the world when launched. Perfectly encapsulating Gérald Genta's design aesthetic, the present watch not only features a Petite and Grande Sonnerie with Westminster Chimes, but also has a tourbillon mechanism. Reference G.0027.7 was made in 1994 in three examples only: the present watch cased in pink gold with a pink gold bracelet, a second example cased in white gold and with leather strap and a third cased in platinum. The caliber 31000 is one of the most impressive conceptions of modern horology. To combine the different complications within the confines of a 39 millimeter case is no easy feat. Over 1000 components of the movement are decorated with painstaking care and inspired by nature. Furthermore, the parts are all hand-mounted. The automatic movement is particularly noteworthy, making this model part of the exceedingly small series of automatic "grande and petite sonnerie" watches ever made.